Fronleichnamsprozession in Hallstatt auf dem Hallstättersee im Salzkammergut. Veranstaltungen im Salzkammergut: Weltberühmte Seeprozession zu Fronleichnam auf dem Hallstättersee bei Ihrem Urlaub in Hallstatt. Fronleichnam in Hallstatt: Impressionen von der weltberühmten Seeprozession bei Ihrem Urlaub in der UNESCO Welterberegion Hallstatt Dachstein Salzkammergut. Veranstaltungen im Salzkammergut: Fronleichnamsprozession in Hallstatt auf dem Hallstättersee bei einem Urlaub in der Ferienregion Dachstein Salzkammergut in Österreich..
Fronleichnam in Hallstatt - © kath. Veranstaltungen im Salzkammergut: Fronleichnamsprozession in Hallstatt auf dem Hallstättersee bei einem Urlaub in der Ferienregion Dachstein Salzkammergut in Österreich. Fronleichnamsprozession in Hallstatt auf dem Hallstättersee im Salzkammergut - © Kraft. 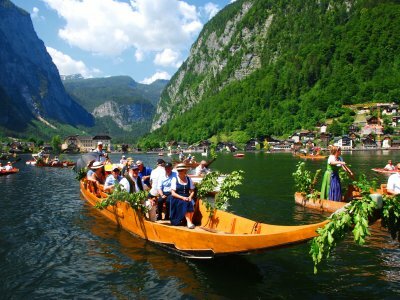 When Hallstatt decorates it’s "Fuhren", the traditional boats of the fjord-like lake, with fresh beech leaves and flowers, and the whole town puts on their “Sunday best” clothes, then it is Corpus Christi. The festival is a commemoration of the Last Supper of Jesus and is always celebrated on the Thursday after Trinity Sunday. Because the small saline village had so little space on land, the procession was moved, around 400 years ago, onto the lake on boats and salt ships; not least in order to get a view of the salt mountain, the old workplace of Hallstatt folk for thousands of years. In today's World Heritage town, the holiday begins with a High Mass in the Catholic church. Weather permitting, the procession continues to the colorfully decorated market square to then finally cast off from the shores on the festive "Himmelsfuhre" boat. The four blessing stations are celebrated on our lake with singing and prayer. What a moving spectacle! What an experience, when the echoes from the volleys of the saluting guns of the “Hallstätter Prangerschützen” bounce off one rock face to the other, when the colourful procession glides majestically over the tranquil lake. Corpus Christi in the Salzkammergut, especially in Hallstatt – is not only an absolute highlight for faithful Catholics. Far beyond the borders of Austria, the Hallstatt lake procession is well known, and visitors from all corners of the Earth come to experience this special day in the UNESCO World Heritage site of Hallstatt Dachstein Salzkammergut. Another feature of the procession are the “Hallstätter Fronleichnamsschützen “ - the Hallstatt Corpus Christi gunners. They announce the most important parts of the procession with their “Prangerstutzen” saluting guns, which are each named after saints. By firing three shots before the Gospel and the blessing of each station, they loudly proclaim the importance of the next few minutes. However, the men of the Corpus Christi gunners must get up a little earlier. They start shooting at the outskirts of Hallstatt at 6 o´clock and then proceed every 15 minutes across the lake closer to the church, at whose feet they then accompany the solemn entry of the clergy to high office with their shots at 9 o´clock ´ In today's UNESCO World Heritage town, the procession was first documented in 1623. The peculiarity of the Corpus Christi procession in Hallstatt is its form. Since then, it has been held on the lake and since 1628 is considered as an everlasting endowment of salt mining in Hallstatt.